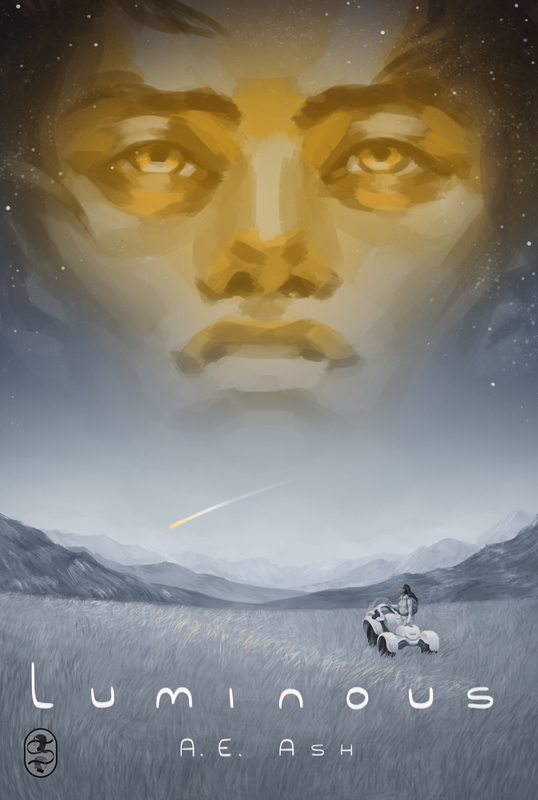 On July 21, we publish the second short story in our summer 2015 line-up of tales of First Contact: Luminous by A.E. Ash. Luminous is our first science fiction romance–a poignant love story between two isolated and unlikely parties. Give a warm welcome to A.E. Ash, everyone! Luminous sprang from two things: a deadline and an image. A deadline—the First Contact call that I had found out about a couple of days before all stories were due. An image that had been in my mind for years: a woman in a quiet, gray place far away from Earth, watching the silent skies only to see a meteor streaking so brightly it burns light-trails in her vision. From the smoking crater at the impact site, someone emerges, golden and alive and impossibly beautiful, and—like the woman—also alone and afraid (I’ll note, I totally hadn’t read Stardust when I got the idea, ha). As I sat down to plan the piece, the woman bled into focus—she was older. A scientist. Alone at first, her black hair streaked with silvery gray and her mind awake and alive and questioning and yearning. Then the man showed himself, golden and alien and also alive and vital, and struggling to comprehend the world he suddenly found himself a part of. Enter the deadline: It was New Year’s Eve and I had just hours to finish writing and editing the piece I’d was hoping to submit to a publication I’d fallen in love with only a month before. I told my husband, “I’m going under,” I loaded up my favorite sci-fi writing playlist, chock-full of dreamy synth and wide-open vocals, new wave, neo-80’s stuff, sci-fi soundtracks, and I wrote until I ended up with Luminous. I spell-checked and hit ‘send’ and felt more at peace with myself than I had in ages. I cannot cite any one influence—it’s too complex, everything so inextricably wound together. I think it was an odd sort of alchemy, a cocktail of hours of playing Mass Effect 2 and Star Wars, the Old Republic mixed with some Star Trek: Voyager and Joss Whedon shows and the Sharon Shinn and C.S. Friedman books I’d recently read along with music like M83 and the Mass Effect OST’s and my rad new wave playlist plus lack of sleep and the quiet of winter and yeah, I completed it an hour before the deadline. I’m so glad I sent it in. I care about Jyothi—I care deeply about her story, and West, and what it all represents to me: a world where a human/alien first contact scenario is light and gentleness. Where a woman is not irrelevant or passed over because of her age, where there is beauty in isolation and hope in silence. If people enjoy reading it half as much as I enjoyed writing it, I’m gtg, kthxbai. Luminous is available on July 21, 2015. You’ll be able to read the short story in full for free here on The Book Smugglers, but we’ll also have a DRM-free ebook (EPUB, MOBI) that contains the story as well as a Q&A and an essay from the author, available for purchase on all major ebook retail sites. And read Luminous for free online on July 21, 2015. First of all I want to say superb blog! I had a quick question that I’d like to ask if you do not mind. I was interested to know how you center yourself and clear your thoughts before writing. I have had difficulty clearing my mind in getting my ideas out. I do enjoy writing but it just seems like the first 10 to 15 minutes tend to be wasted simply just trying to figure out how to begin. Any suggestions or tips? Many thanks!